Mirrored furniture. A small selection. Mirrored furniture, homewares and gifts. Scattered throughout the store we have the occasional piece of furniture and various gift items we find on our travels. Most of the items in the store (and on this web site) are "one-off" items. We try and keep the site up-to-date but we suggest you call or e-mail to make sure we still have the item you are looking for. Right now we have several mirrored cabinets on display. 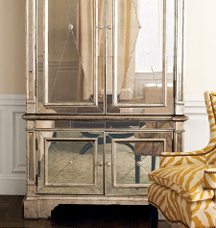 There are bedside tables, chests of drawers, a seven-drawer tall boy, a buffet and the large mirrored armoire shown below. Other furniture in this range can be ordered. We've also just received a small shipment of side tables including the unusual deco-style mirrored Armond table and the very popular Montana table in ebony and antique gold with a bevelled mirror top (see below). Subscribe to our e-mail newsletter to receive special offers and discount framing.